WHERE DO GROUND BEETLES LIVE? Ground beetles are commonly found on the property of most any home. 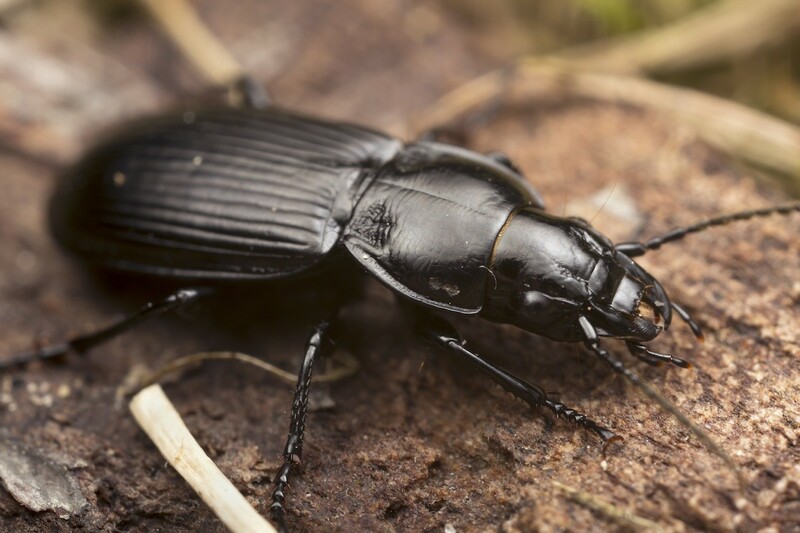 Generally considered to be a perimeter pest, ground beetles can become invasive when left to populate and nest. These beetles will range in size from less than 1/4 inch to almost 2 inches long. Generally dark brown to black, their bodies are tough like armor and they are quite resilient. You’ll notice a large sounding “crunch” when stepping on one. This ample body “shield” does a good job of protecting ground beetles from traditional insecticides but they can be controlled when using the right actives. 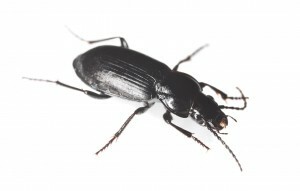 There are many species of ground beetles that can live around or in the home. Ground beetles are predatory and commonly forage for food in the dark of night. For this reason they’re many times able to go unnoticed until their numbers reach the thousands. Under the protection of darkness, they’ll emerge from rocks, mulch, wood chips and pine straw to go about their nightly business of foraging for food. As predatory insects go, ground beetles are quite strong and can cover large distances in relatively little time given their short body size and lack of wings. Fortunately for them, nature has seemingly wired their senses to innately know where good food supplies will be readily available. As most people know, insects are attracted to light. Apparently, the word has gotten out and ground beetles are now “in the know” as well. Bright lights, especially the blue and white neon lights commonly found at gas stations or roadside cafés seem to be particularly attractive to ground beetles. Homes which burn porch or deck lights will also many times attract insects which in turn attract ground beetles. And though turning it off may seem to make the beetles go away, all that’s really happening is a redirection of the population that’s undoubtedly living somewhere on your land. In other words, if you don’t treat their nests or the turf over which they must travel to forage, it’s highly likely they’ll start foraging inside your home at some point in the near future. Because of their thick skin and upright body motion used when walking, ready-to-use sprays won’t prove effective for this pest. To treat successfully, you’ll first need to apply BIFEN GRANULES to the turf and mulch areas surrounding the home. You’ll need to treat at least 10 feet out from the foundation and your goal is to create a band of treated soil. This band will act as a sort of barrier through which foraging ground beetles will no longer be able to navigate. Other pine straw and mulch areas on your property outside this “band” should be treated as well. Remember, ground beetles forage over great distances so any nest sites on the property can lead to persistent home intrusions. Bifen granules should be applied at the rate of 1.2 lbs per 1,000 sq/ft of turf. Apply some monthly when they’re active; once every 3 months to insure they don’t return. 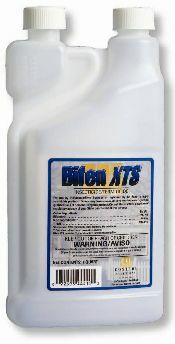 After applying the granules, spray over the top with BIFEN XTS CONCENTRATE. 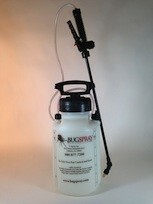 This active works very well on ground beetles. You’ll note very little active will be needed per gallon of water but it will provide a quick kill and lasting residual. 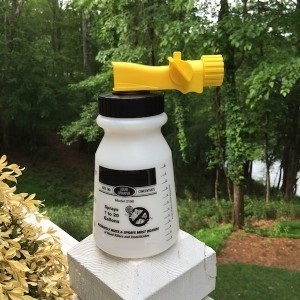 Bifen should be applied at the rate of 1/2 oz per gallon of water when using it in a standard PUMP SPRAYER. Use this mixed gallon to cover up to 1,000 sq/ft of ground and home siding. Apply the mixture with a good pump sprayer for most treatments. If the beetles have already invaded your home, spray baseboards with the Bifen. But for cracks and crevices you can’t treat with the liquid, get either D-FORCE or the PT PHANTOM aerosol. D-Force has a slight odor but it’s quick acting, easy-to-use and will provide a fast knock down. Its ideal for use when you know where they’re nesting or hiding. Phantom is non repellent and won’t be detectable by insects. This means they’ll readily walk over it. But unlike Dforce, Phantom is NOT fast acting . In fact it will take 2-3 days to kill any pest but this is by design. During this time it will be transferred to other insects which in turn will cause many to die even if just a few touch it. Phantom is the better choice to use when the problem is wide spread and hard to figure out where they might be living.